I was a tiny bit late getting the memo. 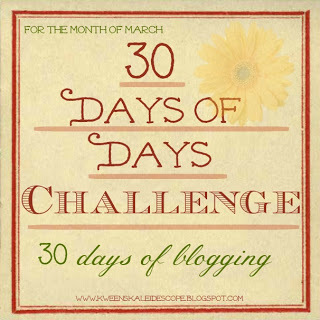 On Sunday, there were some changes made to the topics regarding the 30 Days of Days Challenge. However, I didn't realize the change until after I had posted "the original" Day 11. The Original Topic of Day 11 was "the day you lost someone important" (living or deceased). The Updated Topic of Day 11 is "a daydream you have often"
So for me, rather than to do two Day 11's, I may just save it to blog about on Day 31, and it will one of my more difficult because I daydream about a lot of things. I believe the rest of them stayed the same. Wow.....so many rules associated with this challenge. Still, there are a lot of interesting posts associated with this whole challenge thing.